Dynamic Headers in SuiteCRM helps user to display/highlight most used field of a module. This will reduce time of user to search a field when viewing record. User can also add some coloring to the field as well. Dynamic Headers helps user to display or highlight any selected fields with color coded and icon to identify field and value easily. You are able to select module, enter a specific header title, select icon, icon color, field and see the preview on the setting page. Display Headers dynamically on detail-view of the records in that particular module. 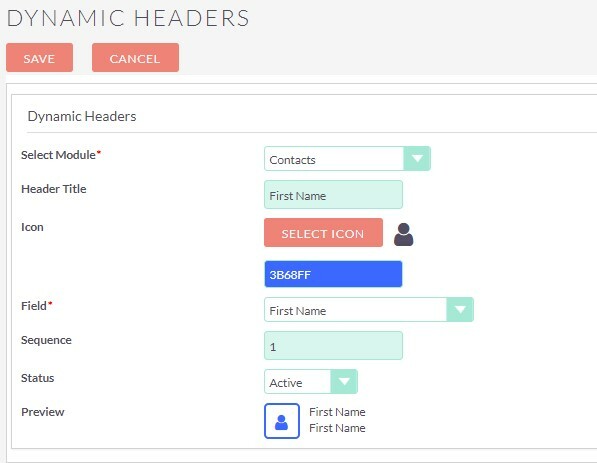 Display icon, header title and value of the field which you have selected from the dynamic headers setting page for that particular module. Here is Dynamic Header's field display part. At a glance, view high level summaries of all related data for a given record. For example, see how many contacts an account has or the total value of all quotes combined for a contact.